Has your kiddo been oddly fascinated with bagpipes lately? Does he have a yearning to be surrounded by mountains while in the greenest grasslands with the fluffiest white sheep? Is finding the Loch Ness monster the number one thing on his bucket list? Well, it sounds like the hills of Scotland are calling your youngling’s name! However if your tyke hopes to fit in once he crosses the pond then we would suggest he gets a tad more cultured. For starters, feast your eyes on this amazing Scottish Costume for children. No big deal or anything, but we actually designed and fashioned this highland themed outfit ourselves here at HalloweenCostumes.com. So we made sure that it’s got all the bells and whistles. He’ll have knee high white socks with red flashes that lead right up to a classic plaid kilt. Then, of course, there’s an awesome sash that matches the kilt, which rests atop a fancy black jacket with shiny silver buttons. To complete the look, a handy satchel hangs around his waist and a fuzzy hat sits atop his crown! Once he becomes familiar with the Scottish language and educates himself with their customs, he’ll be fully prepared to frolic in the wonderland that is Scotland. Your kiddo may have dreams of an international adventure but he'll truly be ready when he’s walking around in these formal foreign duds. 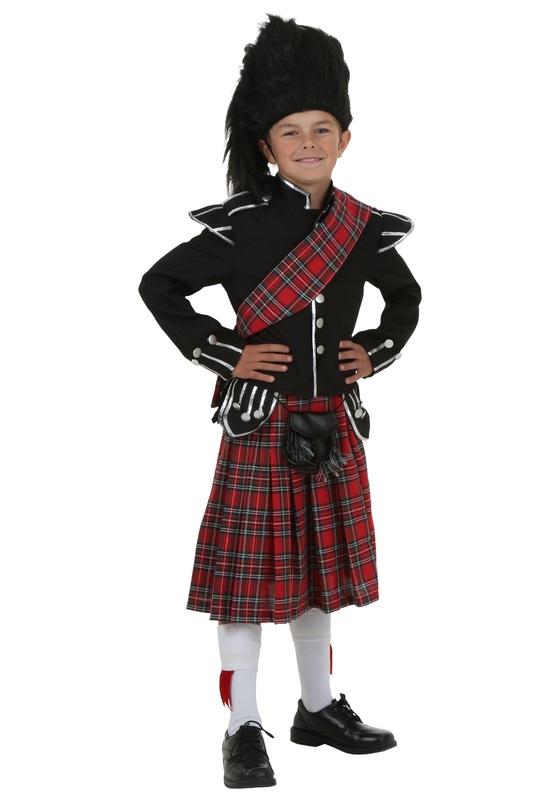 Although if a vacation half way around the world is a bit out of your budget, this spiffy Child’s Scottish Costume will also be great for Halloween or any other fun costume party! Great detail and perfect fit. Although, all the seems are exposed inside the jacket which makes it itchy against young skin. Needs to wear tee shirt underneath.